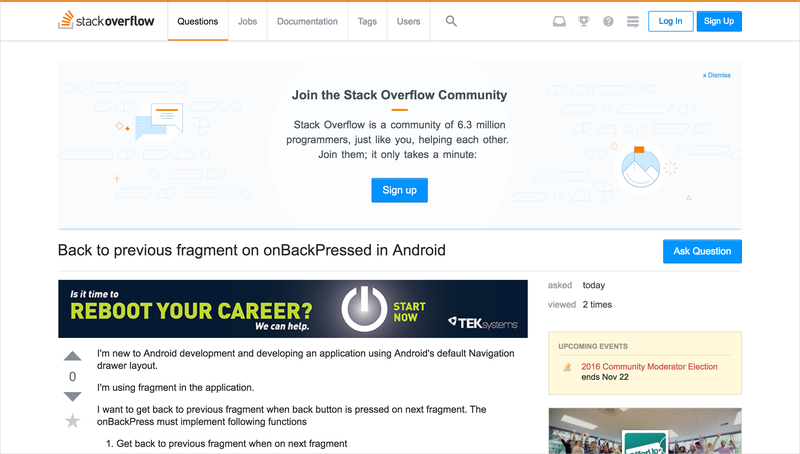 As what Stack Overflow has to offer folks has grown considerably in the last year, we're going to be testing some changes to the top navigation that we hope will help new users find all of the things that the site has to offer. The top navigation part of the site has always been extremely cramped. Now that we have Documentation and Jobs, we're left with even less space to contend with, so we'd like to try something new. Additionally, we want to make sure new users become at least aware of the other things the site has to offer beyond Q&A. If you arrive to the site anonymously, you'll have a random chance of seeing the new nav on your first page load. How long is the test going to run? We expect the test to run for approximately a week. The thing about these kinds of tests is you never quite know until you start seeing data. If we realize that tweaks are needed, or we didn't measure something that turns out to be important, it might take a few weeks instead. That's great, and we totally welcome it. But this is a very, very early attempt to see if we're going in the right direction. If the test looks promising, we might look to test with some logged in / experienced users also. We'll just have to see how the numbers pan out on this one. I'll update this post with our results, and let folks know what our plans on. There will be a separate discussion way prior to any major changes being rolled out - this is just a test. Is this specific to Stack Overflow? Yes, this applies only to Stack Overflow. You appear to be following the fashion of representing a search field by a small icon of a circle with an appendage. As a user of other sites, I always find this frustrating. The smaller area makes it harder to spot. It's also harder to activate the field: there's no placeholder text indicating where I can click to get a caret and start typing. And as a user of Stack Overflow specifically, I think it's a bad idea to make it harder to find or use the search field. For general site use -- and especially for anonymous users -- that's the most important nav option; it's not even close to being on par with the raw "Questions" or "Users" lists. That said, and in the same vein, kudos for removing the "Ask Question" button! The top navigation part of the site has always been extremely cramped. lead to adding more things to it? The new version is clearly more cramped. If you mean vertically, then good; the current version is nice and small and stays out of the way. My first thought when I saw this was, "SO wants to get more traffic on Docs and Jobs." If that's what you're really trying to do, please just say so. This change doesn't seem to have any other actual benefit. I have an issue, in two parts. Both are related to the as-yet-unexplained iconography. You seem to be replacing the long-used and well-understood "rep" button (vertical lines of various heights as in a column chart) with a trophy that has a star in it. Or are you? It's not clear from your posting. What is the visual combination of the "hamburger" and "voice balloon" supposed to represent? In recent years, the "hamburger" (three horizontal lines stacked) has been coming to represent "options" (i.e., replacing traditional text menus across a horizontal strip). The voice balloon means different things depending on whatever site you're on. I think combining those things, while it is clever and no doubt solved some designer's immediate problem, is unnecessarily confusing. Or is it? How would we know absent some description of what these things do? Again, the problem is that I don't see anything that explains the iconography. Perhaps you can edit this post to make it more informational. Make it easier to log out...Most places have the log out on the top right - SE goes against this and tucks it away on the top left menu? WTF. I had a hard time just finding this - it should be intuitive and easily located. Make the ask button stand out more - prime example - use workplace.stackexchange as an example. Notice the ask question is put in a little sticky note in yellow very noticeable and easily located. Why can we not do something similiar on this site? But will this design eventually be rolled out to all the other sites? I think that it should - or at least have a design that can work across the network. I frequently visit other SE sites and I think that the transition between designs would be jarring for me and possibly others. For example, the location of the inbox and achievements buttons is on the right side in the new design. Stack Overflow is part of a bigger network of sites. True, it's the biggest, it's the main income revenue, but it's still one Q&A site in network of 150+ sites. And this change will cause the site to appear as if it's not part of this network. You're actually taking Stack Overflow out of Stack Exchange. As with any big change, it will take time to get used to it, but having it only for one site will make users who are active on other sites in addition to Stack Overflow confused and irritated (well, at least me) from the totally different design between Stack Overflow and the other sites. Bottom line: I think this is a mistake. I am personally quite neutral to any change but as I understand, it is addressing new users. So my first impression would be: is it not kind of, ehm, boring? excuse me for such expression. I don't mind personally, I like boring design. But there is so little contrast and volume in the bar. Also I think it is not a good idea to put everything in one line. The gaps between clickable elements is so small, and the icons are slightly too small. So it looks too condensed. I like when sites have narrow, fixed column design in general, not extending the top bar much to the sides, it is easier on eyes and to navigate. What I would probably make: put main buttons right below the logo, make them more prominent and more contrast. Then one has more place for the search bar also, which could be extended to the right. Something positive: I really like that there is no black stripe on the top, in this sense it is definitely more pleasant than current design. Not the answer you're looking for? Browse other questions tagged discussion top-bar a-b-testing .